While Martin mainly played monsters in the classic series, he also occasionaly played human characters including a miner named Hughes (The Green Death), although he was not always credited. Martin’s career was not limited to Doctor Who; he also appeared in films including Monty Python’s The Meaning of Life in the opening segment “The Crimson Permanent Assurance“; he played Ingemund the Old in Eric The Viking; and was a dance instructor in Pink Floyd’s The Wall. Martin also appeared in many television shows including I, Claudius, Z Cars, Quatermass and the Pit, and the 1980s Tripods series. Of course, normally, Martin was never as easy to spot in his many appearances as Daleks as he is in the photo at left, taken during the production of the Second Doctor’s first story, Power of the Daleks. However, you can often recognize him in costume because in most of the Dalek stories he appeared in, he was playing the “lead” Dalek — either in terms of the Dalek’s actual rank, or simply the first to enter a scene. He was given the lead Dalek position due to his many years in the part, having played Daleks since The Chase in 1965, straight through to Remembrance of the Daleks in 1988. 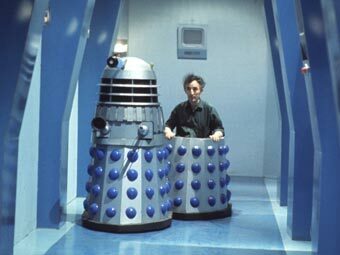 After the revival of Doctor Who in 2005, Martin had hoped to return to the series to once again play a Dalek, but nothing ever came of this, perhaps due to his health problems. John Scott Martin passed away on January 6th, after a long struggle with Parkinson’s. For those who wish to see something of Martin’s personality and hear his memories of working on the series, I recommend tracking down a copy of the documentary “I Was a Doctor Who Monster“, which features interviews with many of the actors to play monsters in the classic Doctor Who series, including John Scott Martin. It is filed under Classic Doctor Who Series, Daleks, Doctor Who, Doctor Who Monsters, Uncategorized.